Spinach and Pistachio Pesto - Tender baby spinach, with toasted pistachios, makes one of the best pestos you will ever taste! It is so hard to believe that we need to start thinking about saving our summer's bounty of fruits, veggies, and herbs, but the reality is if I don't plan ahead I end up missing the boat and tons of goodies go to waste. So when August hits I am wracking my brain, and making a game plan for how I am going to make sure we can nosh on the fruits (or in my case veggies) of our labor AKA our garden. Obviously I am not the only one that thinks like this because the whole Sunday Supper family is making plans to save delicious goodness that is our summer fruits, vegetables, and herbs. So make sure to check out all of the fabulous ideas they have come up with and the bottom of this post! I thought about doing something with tomatoes because I plant tomatoes every year. This year they are not doing the best, and currently I just have a ton of green tomatoes. I bounced around the idea of doing some kind of pickled tomato, or green tomato relish, but I already have several recipes for the ways that I preserve those luscious summer tomatoes. Give my Pico de Gallo, Salsa Fresca, and Roasted Tomato Salsa Roja. Next year I am going to grow tomatillos so I can make more of this Roasted Tomatillo Salsa. It is seriously deeeeelish and makes some fantabulous enchiladas! But I am a tad bit obsessed with pestos. I love how versatile they can be. You can make them with just about anything your little heart desires. A few of my faves are Sun-Dried Tomato Pesto, Pesto alla Trapanese, Green Chile Pesto, and of course Classic Pesto. If you are lucky enough to find garlic scapes, this Garlic Scape Pesto is awesome too! This pesto is a major star in my household right now. I am a huuuuuuge pistachio lover so I can, and have been seen to on several occasions, eat this stuff right off a spoon. Kevin love the fresh taste the spinach gives it. Last night I made flatbread pizzas with this pesto, mozzarella cheese, grape tomatoes, and balsamic reduction drizzled on them. Hooooolllllyyyyy cow, they were good!! Two flatbreads were gone in record time, with a little bit of growling and shoving for the last two pieces. My kitchen can be a dangerous place sometimes! I should get hazardous duty pay!! Toast pistachio nuts in a skillet over medium heat until fragrant, tossing occasionally to ensure even toasting, about 5 minutes. Combine all of the pesto ingredients, except the olive oil, in a food processor and pulse, drizzle in the olive oil slowly until well combined but still rough-textured (You may not use all of the oil or you made need a bit more to get to the desired consistency). Spread on sandwiches or stir into pasta. Store pesto in an airtight container and cover with a layer of olive oil. BIG thanks to Stacy from Food Lust People Love for hosting this Sunday Supper event! Now take a look at the amazing ways to "Save Summer's Harvest" from the Sunday Supper tastemakers. When I saw this photo on Amy's collage, I could not wait to see the recipe. 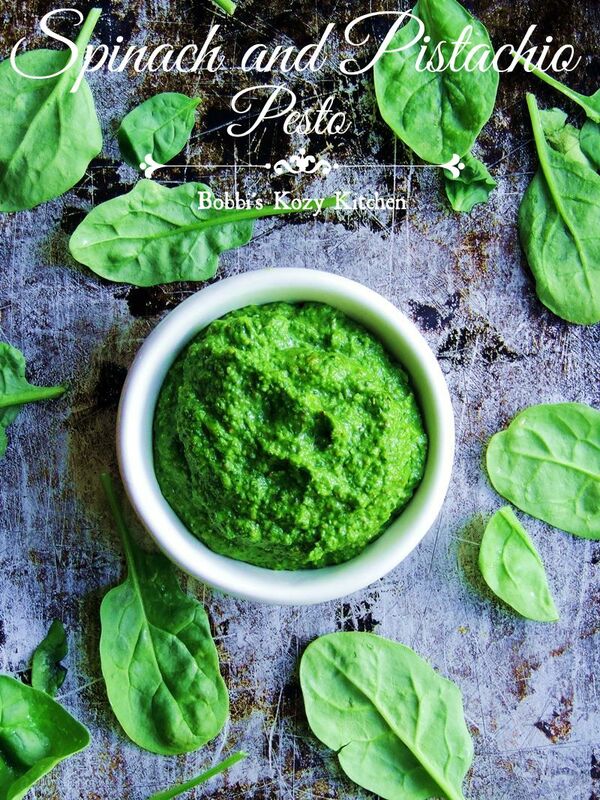 What a fabulous vibrant green your pesto is, Bobbi! Stunning! I love the vibrance of your pesto! And pistachios??? YUM! I believe this is the pesto that will finally get my husband to enjoy pesto. He does not like basil at all and he definitely likes spinach and pistachio. Oh wow....I'm always looking to make my pesto different! Now I need to go buy some pistachios! Yum! i love trying different pesto recipes! What a unique pesto. I can't wait to try it. I can always go for pesto anything! I don't have any fresh parsley. What if I leave it out and use extra spinach?